Complete your mission even in the shadows with the FIRESTRIKE blaster! This compact blaster s precision light beam targeting gives you laser-like focus even in low-light conditions! Activate the Light Beam Trigger to zero in on targets up to 15 feet away. The FIRESTRIKE blaster launches Elite Darts up to 75 feet! As with most N-STRIKE blasters, the Tactical Rail lets you add most N-STRIKE Tactical Rail accessories (sold separately) for more battle capability. Power up the Light Beam on your FIRESTRIKE blaster and hit your target with one shot! 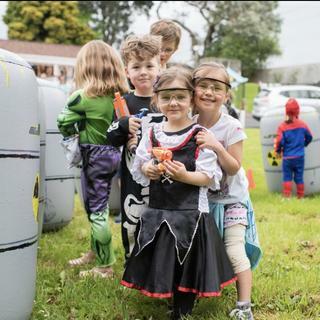 We are a team located in Auckland who run games of "Nerf Wars" and use this Nerf gun, especially for younger children's birthday parties. Would highly recommend for young children as it is easy to load, the pull back part can be a little hard for kids under 5. However, a great gun with good firing distance.